Nearly a year after German fintech startup N26 announced that it would launch its service in the U.K., the company is launching in the U.K. N26 is already quite popular in the Eurozone, with more than 1.5 million customers. In this new market, it will face tough competition from existing players, such as Revolut, Monzo, Starling and many others. N26 is going to roll out its product in multiple phases. Some lucky few will be able to open an account right away. The startup will then go through its waiting list — 50,000 people already left their email addresses to express interest. After that, anybody will be able to download the app and sign up. This might sound like a convoluted process, but N26 expects a full public launch in just a few weeks. So it should be quite quick if everything goes as planned. So what can you expect exactly? British customers will get all the basic N26 stuff with one killer feature — U.K. account numbers and sort codes. This way, customers will be able to receive payments and share banking information with their utility providers just like they would with a regular Barclays or Lloyds account. When you open an N26 account, you get a true bank account and a MasterCard. Basic accounts are free, and N26 has a proper banking license — your deposits up to €100,000 are guaranteed by the European deposit guarantee scheme. You can then send and receive money and pay with your card. Sending money to other N26 users is instantaneous (they call it MoneyBeam). N26 recently launched Spaces, a new feature that lets you create sub accounts and put some money aside. It’s still limited, but the company plans to add more features. Your MasterCard works like any other challenger bank. Every time you use it, you receive a push notification. You can set payment and withdrawal limits, lock your card if you lose it and reset your PIN code. N26 will also bring Black and Metal plans to the U.K.
How does it compare to Revolut? Let’s be honest, the elephant in the room is Revolut . The company has hundreds of thousands (if not over a million) customers in the U.K. N26 lets you do many of the things you can already do with your Revolut account. So let me point out a few differences. As I noted, N26 has a banking license and U.K. banking information. N26 cards work in Apple Pay and Google Pay. 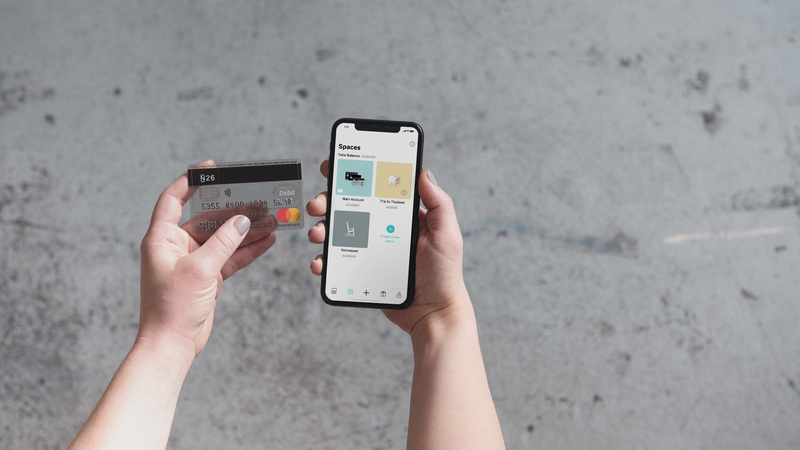 When it comes to international payments, N26 lets you pay with your card anywhere in the world without any additional fee. The company uses MasterCard’s conversion rates. Revolut first converts the money with its forex feature and then lets you spend your money. There are an infinite number of forum posts about the exchange rates you’ll get. Sometimes Revolut is cheaper, sometimes N26 is cheaper. It mostly depends on the day of the week (Revolut conversion rates are more expensive on the weekend) and the currency. Unless you plan to spend tens of thousands of GBP during your vacation, you won’t see a huge difference on your bank statement. Revolut also has many more features than N26. You can insure your phone, buy bitcoins, buy travel insurance, create virtual cards and more. It’s clear that N26 and Revolut have two different styles. Revolut has a bigger user base than N26. But it’s always been a bit hard to compare them, as N26 wasn’t available in the U.K. Of course, they will both say there are tens of millions of people relying on old banks — multiple challenger banks can grow at the same time if they capture market share from those aging players. Still, the battle between N26 and Revolut is on.